On Saturday, June 21st, 2014 I was in Saxapahaw on a weekend excursion to get away from Chapel Hill. I have been to the Saxapahaw General Store a few times and I always stop by Flying Beagle Books (A review on the bookstore to come! Here it is – Flying Beagle Bookstore Reviews). On this particular trip I noticed vendors setting up in the parking lot outside of Flying Beagle Books. There is a weekly summer festival every Saturday evening from 6:00 pm to around 9:00 pm and the Maple View Mobile Homemade Ice Cream “truck” was one of the vendors that opened early. With it being a very hot summer day, the second day of the summer in fact, it was a perfect afternoon to grab some ice cream. I stopped by the ice cream truck, with a friend of mine, and we started to chat with the individual working the counter. We later found out this was Jerry Richardson that owns Maple View Homemade Ice Cream. He was very kind in letting us taste samples of the strawberry ice cream. After tasting a sample I knew this was the bowl for me. My friend also choose the strawberry bowl. If you are every in the need for some entertainment in or around the Triangle I would strongly suggest making the trip to Saxapahaw. I would also strongly suggest stopping by the Maple View Mobile Homemade Ice Cream truck and getting some strawberry ice cream. Tell Jerry that Jesse sent you. So, let us talk about this strawberry ice cream. It is amazing. I give it five stars (on a scale of one to five). One week later, my friend claims she can still taste this ice cream on her tongue. If you have ever tasted it I would love to get your review below. Please feel free to leave it in the comments. From UNC, it is about a 10 mile bike ride or trip by car. If you are a freshman or sophomore at UNC and you have yet to go to Maple View Farms I would strongly suggest going. It is quite the buzz on Twitter and Instagram. By searching Maple View, on Twitter, at the end of the spring semester or beginning of the fall semester you will notice dozens of tweets with pictures of all the different flavors of ice cream. I was completely unaware of Maple View Farms until I saw some of my undergraduate friends and writers tweeting about the amazing ice cream. If you have been to Maple View Farms to taste the ice cream please feel free to leave a comment below with your review. The Maple View Farm offers a few more flavors than Jerry Richardson offers at his Maple View Homemade Ice Cream truck but not many. Jerry has strategically named some of his combinations for the local universities which are UNC, Duke, NC State and Wake Forest. If I remember correctly they are named for the mascots which are the Tar Heels, Blue Devils, Wolfpack and Demon Deacons. While I did not try any of these combinations they all looked delicious. You can also email him at mapleviewmobile@gmail.com. He tends to make appearances at grand openings, block parties, pool parties, weddings, birthday parties, street fairs and school events. You can always shoot him an email or give him a call to see where he will be in the coming weeks. Not only will you be able to enjoy some amazing ice cream but you will also experience a fun and exciting event. If you are ever in Saxapahaw for the summer concert series you may want to check out some of the other amazing location businesses. Make sure to use this resource: North Carolina Triangle Reviews. It is true. Maple View Homemade Ice Cream is unlike any other. I was excited to read on the food truck that the ice cream is hormone-free and antibiotic-free. You cannot beat an incredible taste with a conscience! I have been lucky enough to taste the homemade strawberry ice cream. It is made fresh and it’s not artificial. Looking at the scoops, you’ll see flecks of strawberry. Truly, the flavor melts in your mouth. Your friend is right – it really stays on your palette. Maple View ice cream is unforgettable. 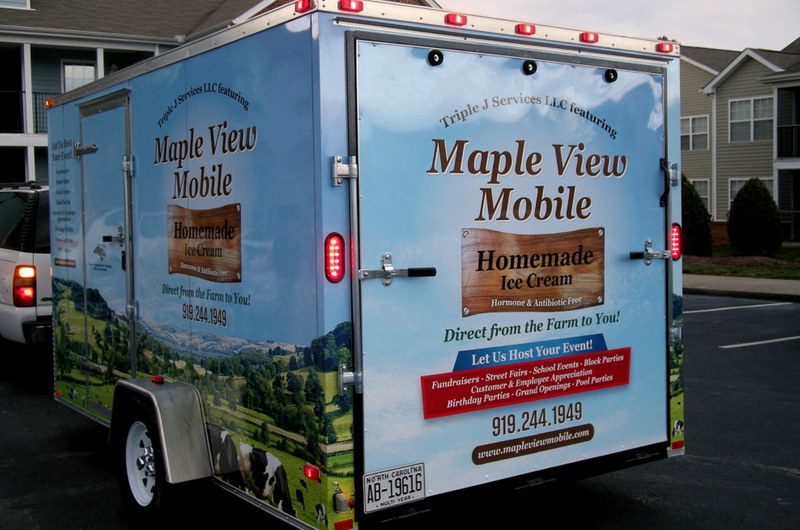 I would love to have the Maple View homemade ice cream food truck at future events. It seems like such an awesome idea. Jerry is a great man to take up a conversation with. I strongly suggest anyone who has not experienced Maple View ice cream to seek it out, IMMEDIATELY! As someone who is a UNC student and has been to Maple View Farm’s “old country store” in Hillsborough several times, I can vouch for the quality of this farm fresh ice cream. Maple View has all the original flavors we grew up knowing and loving – such as their strawberry, vanilla, and chocolate (and double chocolate for you chocoholics!). But part of what makes Maple View unique are the flavors they custom created to cater to the colleges in the surrounding area. Their ice cream cases feature “Carolina Crunch”, a vanilla based flavor with pieces of Heath bar mixed in dedicated to us Tar Heel fans. More recently they also added “Devil’s Delight” to their selection in the country store in Hillsborough. Named for Duke University, Devil’s Delight is a chocolate ice cream creation with chunks of Kit Kats, chocolate chips, and Twix, I believe (don’t quote me on that last ingredient!). Even as a person with a plain palette – I usually only ever get chocolate with M&M topping – I can whole heartedly say Maple View has some of the best ice cream I’ve ever had with the greatest variety of flavors! The country store has a very homey, family-oriented environment and is a great place to visit with loved ones! It’s an especially great place to take kids who can enjoy their dessert rocking on the porch outside while watching cows graze in the fields – which are right across the road! Maple View’s delicious farm fresh ice cream is well worth the drive, the money, and the calories! I made my first trip out to Maple View a few months back with a some friends and was immediately taken by the store’s country charm. The front porch is lined with rocking chairs and the interior is decorated with vintage memorabilia, creating a relaxed, warm, and distinctly Southern atmosphere. But more importantly than the appearance is the ice cream, and Maple View does not disappoint. The store boasts a wide variety — from the tried-and-true classics to the exclusive university-themed flavors, all of which are delicious. I’m partial to the cookie dough, which is rich, creamy, and quite possibly the best ice cream I’ve ever had. As a UNC student, it’s nice to be able to take a quick drive out to Maple View and really feel like you’re getting away from campus life, even if just for a little bit. It’s a great place to go with friends, and definitely a great place to take the family. Anyone who hasn’t been needs to drop everything and drive out there now. You won’t be disappointed!